One of the best things about eating a burger is the condiments and sides. My favorite is onions rings. Fries and chips are great, but they can’t compare to the explosive flavor and crunch of onion rings. Making your own is easier than you think. Most of the prep can be done the day before, so all you have to do is fry them when you are ready! 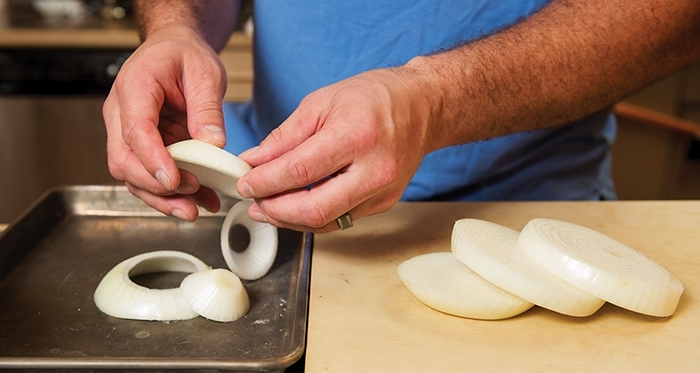 run-of-the-mill yellow and white onions will work great for onion rings. The rings can be cut as thick as you want; the thinner the ring, the quicker they fry. Try each of the recipes below and see what you like. The type of fat you use is important. Some fats work well; others do not. Fat has three temperature points: melting (solid to liquid), smoking (when the liquid starts to smoke), and combustion (when the smoking liquid ignites). Depending on what you are frying, the desired temperature is 350 to 375 degrees. Some fats (whole butter, sesame oil, coconut oil and extra virgin olive oil) start smoking just as you reach the desired cooking temperature, so they are not good for high temp cooking. The oil may develop an off flavor and go rancid more quickly. Other oils (safflower, soybean, peanut, corn and vegetable oil) don’t start smoking until well above 400 degrees and are optimal for frying. An onion ring that has been battered and fried will produce an airy puffed crust, similar to tempura. It will be crisp right as it comes out of the oil, but tends to become soggy quickly as there is a lot of moisture in the batter. The addition of cornstarch to the batter helps produce a crisper exterior. Beer, club soda or sparkling water helps aerate the batter, and sometimes a chemical leavening agent such as baking soda or baking powder will also help lighten the mix. 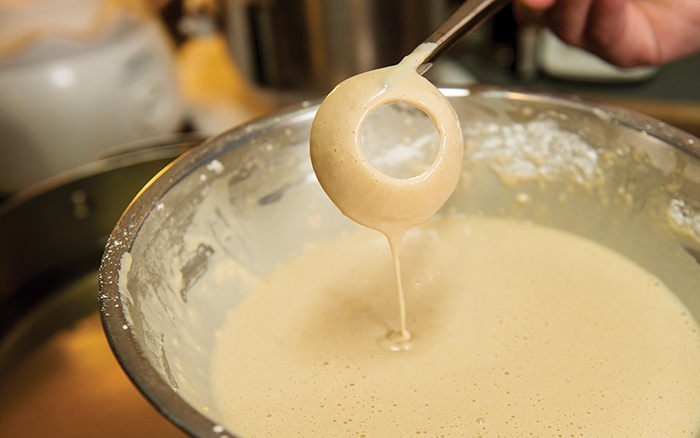 Be sure not to make the batter too early, as the carbonation and leavening reaction will be lost. Seasoning and tossing the sliced onions in flour will help the batter stick, resulting in a thicker coating. For a lighter, thinner crust, leave the flour off. Flour — add a small amount of salt, pepper and herbs or other spices as you wish. 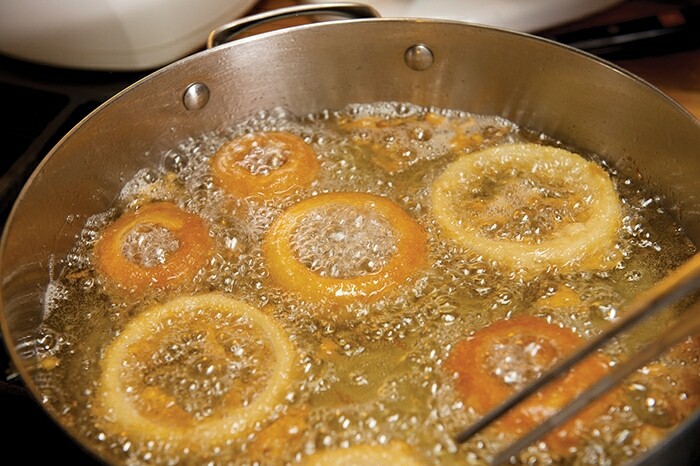 When frying large batches, put the onion rings into a bag of seasoned flour. Let the onions sit in the bag, shaking occasionally for 30 minutes to an hour. This allows the flour to adhere to and absorb the moisture on the outside of the onion rings, helping the egg wash in the next step stick to the flour. Shake off all excess flour. Tip: Once breaded, the rings can be placed on a tray (not overlapping or touching) and frozen. They will keep in a zip-locked bag for up to a month in the freezer and can go straight from frozen into hot oil. Egg Wash — One egg with about 4 to 6 ounces of milk works well. If you want a thicker crust of breadcrumbs to stick, add another egg. Lightly season to your preference. Make sure that all excess egg wash is removed to prevent clumping when fried. Bread Crumbs — Any type of breadcrumbs or cornmeal will work for this step. I prefer Panko. They give great crunch to any fried food. Season after the rings are coated and fried. This is a simple way to make crisp onion rings or onion straws (or even fried chicken). Season thinly sliced onion rings or strips and cover them with buttermilk anywhere from one to 24 hours. Remove onions and coat in seasoned flour. Fry until golden brown and season with salt as needed. This works great for a side or as a burger topping. Mix all ingredients together except egg yolk and water. While oil is pre-heating to 365 degrees, prepare onion rings for frying (store cut rings in seasoned flour for thicker batter on each ring). Add yolk, and mix water or beer into the dry mix until the batter is thicker than cream but thinner than pancake batter. Dip each item into the batter and allow the excess batter to drip off. Place the edge of each ring into the oil and fry for a couple seconds before releasing. Repeat until pan has enough product in it to manage each item without overcooking. Remove from the oil and place onto a tray with paper towel. Lightly sprinkle with salt.